Nippon Telegraph and Telephone (NTT) Corp says it is developing a consumer version of a galvanic vestibular stimulation machine. It uses electric current to cause your body to feel the need to move on demand. A special headset sends a low voltage current from the back of your ears through your head - right to left or left to right, depending on what the person with the "human controller" joystick chooses to do. Galvanic vestibular stimulation confuses the nerves in your ear to throw off your sense of balance. Since you feel unbalanced, you seek to orient your body properly. When the controller turns the switch to the right while you are walking, your body rebalances itself to veer to the right - without conscious thought. According to researchers, it is possible to force a person to actually walk along a predetermined route - like a pretzel-shaped path - using the device. In looking around for science fictional antecedents to the idea of a remote control for a person, I recalled the Star Trek episode Spock's Brain, which aired September 20th, 1968. In the story, Spock's brain is actually stolen right out of his head by beautiful aliens, leaving the body behind. 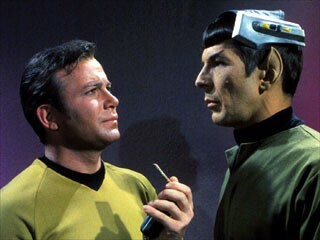 McCoy fixes up a device that lets him control Spock's brainless body remotely; he fiddles with the controls on the remote, and Spock walks. Science fiction stories about mind control almost invariably include the idea of telepathy by an organic mind, rather than by a mechanical device. For example, the thought-screen from the 1940's novel Gray Lensman by E.E. "Doc" Smith is intended to protect the user from beings with mind control powers. Robert Heinlein, in his 1951 novel The Puppet Masters, writes about "slugs" from Titan that ride on a human being and take complete control of the brain and nervous system. Swibble-culture is an organic phenotype evolved in a protein medium under controlled conditions. The directing neurological tissue that forms the basis of the swibble is alive, certainly, in the sense that it grows, thinks, feeds, excretes waste. Yes, it's definitely alive. But the swibble, as a functioning whole, is a manufactured item. 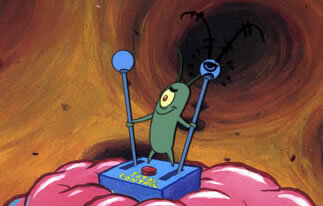 More recently, the evil Plankton hopes to force Spongebob Squarepants to reveal the secret Krabby Patty formula by taking control of Spongebob's brain with a device labeled "Total Control" and forcing him to walk right out of his house. I'm hoping that, by including this whimsical reference to a popular children's television show, any unfortunate paranoids who come upon this page will be reassured that this product will only be used for fun and games. Despite the fact that users of NTT's experimental device claim that "It's a mesmerizing sensation similar to being drunk or melting into sleep under the influence of anesthesia. But it's more definitive, as though an invisible hand were reaching inside your brain." Rest assured, though; you can even remote-control yourself by taking the device into your own hands. Read more at Remote control device 'controls' humans; found it at /..